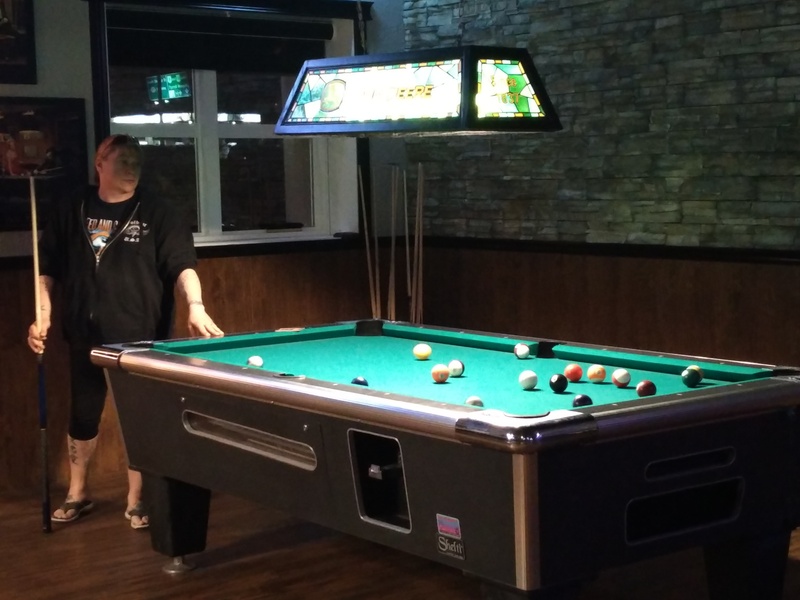 One of Drumheller's most unique watering holes, the Long Branch Saloon is a great place for Tuesday night pool league! Sheila, the owner can be found serving patrons most nights and has been a long time supporter of the league. Next time you are in Midland, stop in for a drink, and check out all photos and memorabilia on the walls. - ALWAYS PRINT STATS NEAT AND WITH BLACK OR BLUE PEN , ESPECIALLY OLDS DIVISION AS THEY GET FAXED TO IN. I NEED TO BE ABLE TO READ THEM ? - IF YOU SEE A PROBLEM SIMPLY WRITE WHAT NEEDS TO BE CHANGED IN THE COMMENTS LINE ON BOTTOM OF SCORE SHEET. I WILL CONFIRM AND UPDATE FOR YOU . 2016 / 2017 Pool Season starting soon! 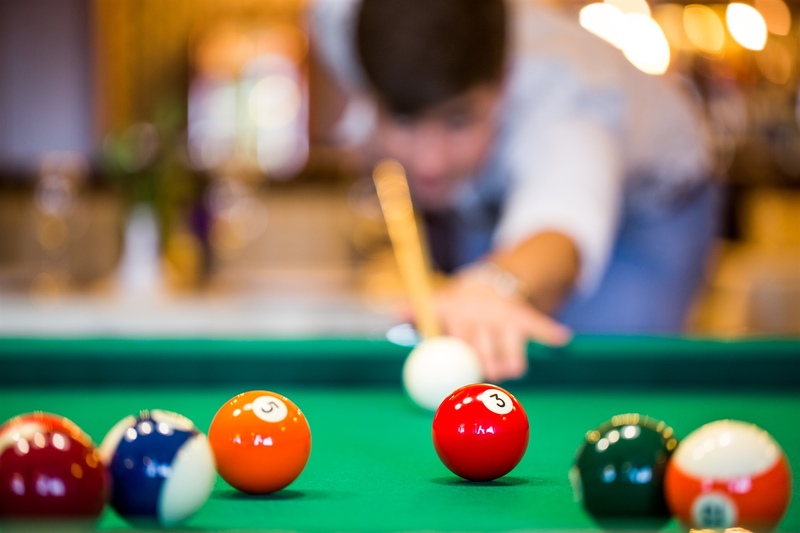 If you are interested in pool league this year, we have our start up meetings scheduled. Please have at least one person from your team attend. If you are a single player, please come and get matched up with a team. AS PER OUR DISCUSSION AT OUR START-UP MEETINGS , THE TABLES HAVE ALL BE UPGRADED TO $ 2.00 TWO LOONIES PER PLAY . PORTION OF THE INCREASE WILL BE GOING INTO YEAR END PRIZING AS PER DISCUSSION AT OUR START-UP MEETING. DRUMHELLER/OLDS TEAMS WILL BE PLAYING IN THE " MIXED 8-BALL OPEN GOLD DIVISION " AT THE RIO . JULY 27TH - JULY 30TH. PLAY STARTS WEDNESSDAY JULY 27 @ 8 A.M. SHARP . YOU NEED TO BOOK YOUR FLIGHT TO ARRIVE IN VEGAS ON THE JULY 26TH OR EARLIER , IN TIME TO GO TO THE" RIO ALL SUITE HOTEL AND CASINO" TO PICK UP YOUR TEAM REGISTRATION PACKAGE BEFORE 8 P.M. TUESDAY AT THE BCA POOL BOOTH IN THE RIO HOTEL SO YOUR TEAM IS REGISTERED FOR PLAY THE NEXT DAY . ONLY YOUR CAPTAIN CAN PICK UP THE TEAM REGISTRATION PACKAGE . JUST GIVE THE FOLKS AT THE BCA POOL BOOTH YOUR TEAM & CAPTAIN NAME .OUR LEAGUE CHARTER # 1217 . YOUR GREEN FEES AND REGISTRATION ALREADY PAYED. ALL YOU NEED IS YOUR PERSONAL SPENDING MONEY FOR VEGAS, FOOD DRINK ETC.YOUR $3000.00 CHEQUE IS FOR BOOKING YOUR FLIGHT & ROOM COMO , BOOK AS COMBO PACKAGE HUGE SAVINGS. NEED FIVE PLAYERS FOR YOUR TEAM IN VEGAS" TWO FROM ORIGINAL TEAM " . 5 PEOPLE IS WHAT THE TRAVEL ROOM & FLIGHT IS BASED ON.STAY ANYWHERE YOU LIKE, DON'T HAVE TO STAY AT RIO IF YOU FIND BETTER DEAL . THESE COMBO'S ON LINE RANGE FROM $ 350.00 TO $ 550.00 YOU HAVE PLENTY TO WORK WITH . BOOK RIGHT AWAY ,IF YOU WAIT TILL CLOSER TO VEGAS TOURNY TIME,RATES WILL INCREASE!!!! I NEEED NAMES OF PLAYERS YOU WANT ON YOUR TEAM ROOSTER FOR VEGAS BY THIS FRIDAY TO REGISTER. CAN HAVE UP TO 10 MAX. WITH SPARES. NAMES MAY BE CHANGED BY CAPTAIN UP TIL EVENT DAY IF NEED BE ? THE RIO ALL SUITE HOTEL ,WHERE EVENT IS HELD AT HAS SPECIAL PLAYERS RATES , USE THE CSI/BCA POOL LEAGUE CODE " SRCUE6 " WHEN CALLING. ALL THIS INFO: AND MORE IS ON THE CSI/BCA WEBSITE : www.playcsipool.com " . YOUR TOURNY REGISTRATION AND GREEN FEES PAID ALREADY , TABLES OPEN IN VEGAS " NO COIN DROP REQUIRED "must BRING YOUR PLAYER SANCTION CARDS , HUGE DISCOUNTS USING CARD BARCODE AT CLUBS , AND FOOD ESTABLISHMENTS ETC!!!! HAVE FUN !!! ALL TEAMS PREVIOUSLY PLAYING FROM SORREL'S PUB , WILL NOW BE PLAYING FROM CARBON VALLEY HOTEL . !!! The new season is well under way. We hope you have a great season folks!! Remember to support your host pub/bar by purchasing some food and drinks. They provide us some great venues to play at, and many of them cover our sanctions fees, etc. Best of luck for the new season! CHECK UNDER EVENTS TAB FOR IMPORTANT UPDATES REGARDING TOURNAMENT !!!!! STATS ONLINE , AVERAGES WILL BE IN EFFECT FOR OCT-11-2016 LEAGUE PLAY. ALSO AS DISCUSSED AT MEETING,TABLE WILL SOON BE CHANGING TO $2 DOLLAR PLAY. THANKS OLDS FOR A FANTASTIC YEAR END TOURNY !!! DRUMHELLER AND OLDS TEAMS YOUR SCHEDULES AND CONTACT LIST NOW ON WEBSITE FOR 2016 - 2017 SEASON. HAVE FUN REMEMBER $ 25.00 SANCTION FEES DUE ON 4 TH WEEK OF PLAY ! NO NEED FOR START UP MEETINGS JUST BE AT LOCATION OF MATCH 5:30 P.M.
6:00 P.M MATCHES :: PLAYERS SHOW AT LOCATION OF MATCH 5:30ish ALL PAPERWORK AND DRAWSHEETS WILL BE THERE FOR STARTUP!!! SOON AS YOUR MATCH COMPLETED TEXT OR CALL MYSELF 403.334.0007 WITH WINNING RESULTS AND IF PLAYING NEXT ROUND TRAVEL TO LOCATION OF PLAY BEFORE START TIME !!!!! I'LL BE BOUNCING LOCATION TO LOCATION AS NEEDED ? BOWL : 1 @ ? Winner of 8&9 OLDS BALLS @ ? ALL SANCTION FEES FOR 2016-2017 SEASON ARE DUE BY 4 TH WEEK OF PLAY !! OCT /11/2016 !! OLDS FINAL 2016 STANDINGS NOW POSTED ON WEBSITE !!!!! SEE YOU FRIDAY ARRIVE AT YOUR POSTED LOCATION PRIOR 6P.M. , TO GET MATCH STARTED ON TIME !!!!! 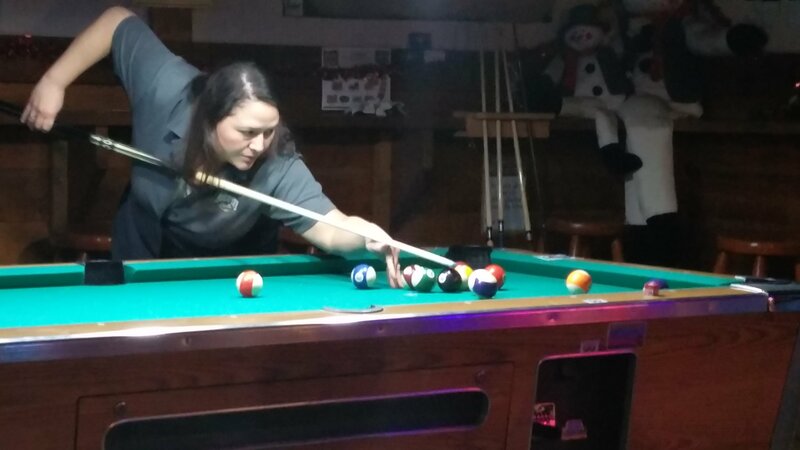 In our new "Ladies of the BCA" series we will be featuring some of the women in pool league. Not just men love playing with sticks and balls you know!! Shown here is Karen, a long time BCA league member and very dedicated volunteer at our year end tournaments. She enjoys long walks on the beach (Newcastle Beach) with her hubby Richard.